Last week, Whitey – the hen who had the hurt leg and we nursed back to health – was once again walking funny. We knew it couldn’t be a result of roosters jumping on her because the roosters were all at freezer camp. Chicken doctor Rachel diagnosed her as egg bound. Egg bound means there was an egg that for some reason was stuck. The remedy was to put the hen in warm water for 30 minutes every two hours until the egg is laid. 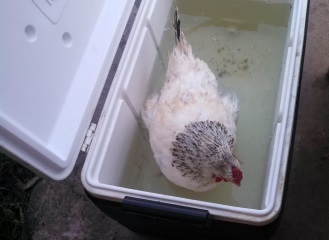 We figured the best place for a warm water bath was an ice chest. We let her soak in her “hot tub” for thirty minutes and then brought her inside to dry off. When this didn’t seem to make much difference, Rachel discovered that Whitey did not have an egg, but a tumor, which would not come out regardless of how many times we let her soak. I did wonder at one point as I watched her hang on to life, if there was a “chicken hospice” organization. I’m sure someone could start one, but not sure, if others would pay for their services. The sad fact was our Whitney was destined to die. A very sad fact, but nonetheless a fact. We all shed a few tears when Whitey did die. Rachel went to the feed store later that week and bought nine baby chicks. Whitey was, indeed, a very special chicken if it took nine chicks to replace her. We also have 24 eggs in the incubator due to hatch next week, but Rachel went to the feed store again and came home with two more chicks. So now, we have potentially thirty-five new birds after losing one. Rachel calls it Chicken Math. I find it at least as confusing as regular math. I’m so sorry about Whitey, We were rooting for her to have a long and productive life. However, I had to end up laughing at your chicken math. 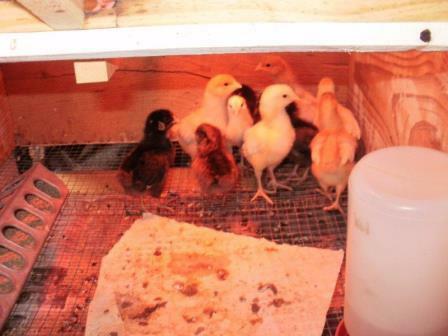 I’ll remember that when I go to the feedstore and see the precious baby chicks.